Leggings have a long history beginning with the skinny pants worn by men in Scotland in the 1400s. Then, Audrey Hepburn in the 1950s brought the style to women. Today, leggings are more popular than they've ever been. But they sometimes get a bad rep for being sloppy. Read on for a guide on how to wear leggings that make you look trendy and classy. Say goodbye to uncomfortable suit pants! One of the best leggings outfit ideas is to pair a set of black leather leggings, heeled boots, and an ivory or beige dressy tank. Throw a sophisticated trench coat over top. The heels and coat go a long way to dress up the leggings. You can also add accessories like a scarf or accent necklace for more interest. It's chic, it's stylish and it's oh so comfortable. Another boss babe look for the office is to pair your black leggings with a black blazer and your crisp work shirt. It has the same power and style as a full suit but is a whole lot more trendy and comfy. If you want more of a business casual look, layer an over-sized t-shirt under the blazer. This hip look will take you from your 9 to 5 to your evening stroll to walk your dog. If you're wondering how to dress up leggings for an evening out, we've got you covered. Whenever you have an event and want to pass on the little black dress, you can pack a punch with a boy-meets girl ensemble that's sure to turn heads. Wear your skinny black leggings with a bra-style top. Throw on a checked blazer and you've got one hot outfit. Don't forget your heels or booties and a bright lipstick for the ultimate wow factor. The best thing about this outfit is that it gives you a long straight line in your silhouette. It's great for making you look and feel taller. We guarantee no one will be dressed the same. So if you're looking for an outfit that stands out among all the boring A-style dresses, rock those leggings. One of the best outfits to wear with leggings in the fall is an over-sized sweater. But if you don't want to look like you just rolled out of bed, stay away from the hoodies. Instead, choose a high-quality over-sized sweater in a textured fabric. Look for sweaters that look knit. The kind with a cowl is an excellent choice. Make sure the sweater goes down past your glutes and sits at your upper thigh. If your sweater isn't quite long enough, opt for an unbuttoned dress shirt from your boyfriend underneath. Ankle boots in any color with your fave pair of leggings will make this outfit both comfy and classy. Or if you want to slay, you can opt for your over the knee boots. It's an easy way to look glam and stay warm. Do you wonder what to wear with leggings that's casual but not grunge? Leggings are a great choice that lends well to street style fashion. But it's a fine line between sloppy and casual, so be careful. Pair your leggings with a loose tee. Tuck in the front of the tee into your leggings. To complete the look, wrap your denim jacket around your waist. Put on your fave Adidas kicks and a pair of sunglasses for a casual style that shows you've got fashion to a T.
Another great legging outfit idea for the summer is a pair of high-waisted leggings. These products offer a great selection for your wardrobe. You don't need to put a lot of time into putting together this outfit. Just pair your high-waist leggings with a crop top to keep you cool this summer. You can wear this to the gym or to the boardwalk. Just change your sneakers for a pair of leather boots or heeled sandals. The best thing about leggings is that you can wear them all year long. They are one of the best transitional items that you can wear between seasons as well. Outfits to wear with leggings include sweater dresses. We love this look for weekends. Throw on a pair of solid leggings and a long tunic or casual sweater dress. Belt it at the waist with a skinny belt. We like to go bold with the belt color for a nice pop. 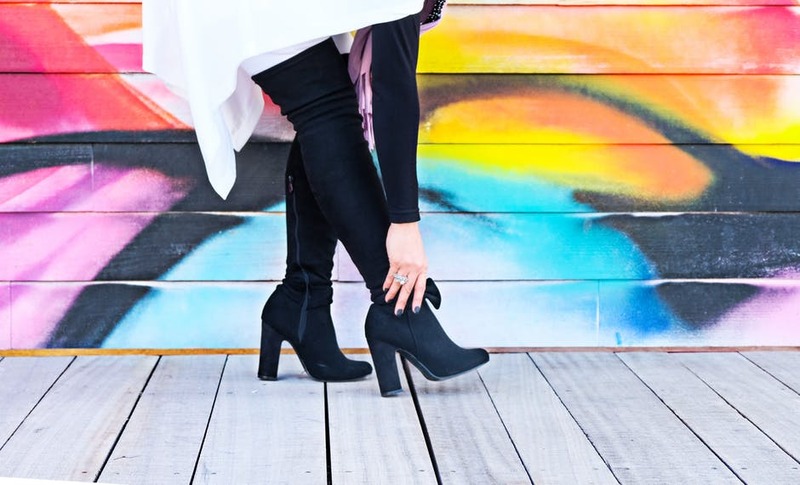 Comfortable ankle boots complete the outfit. This outfit is perfect for brunch with your girlfriends, visiting your parents or grabbing coffee in between errands. Most of the legging outfit ideas on this article talk about black leggings. That's because they are the easiest to work with. You can dress them up or down. But that doesn't mean you can't wear bold leggings with printed patterns. Printed leggings are fun, playful and a way to show off your personality. But, you need to choose wisely. Sometimes a certain print will look great on the shelf but will stretch all wrong on your body. Depending on your body size, not all prints will suit you. So go ahead and experiment but be careful. Check how the print looks from all angles. And remember, if your leggings have a lot going on, pair it with a solid, neutral top. There you have it! A bunch of ideas on how to wear leggings all year long. From the office to the gym and everything in between. Next, check out these 10 tips and tricks for long road trips. Me too! Leggings are some of my favorite things! Thanks so much for taking time to stop by, read, and comment on this post! I hope you have a wonderful day!